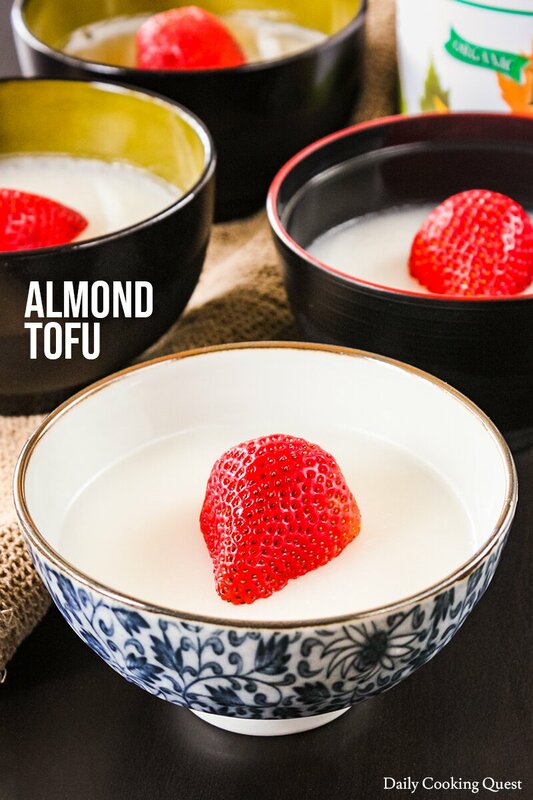 An easy recipe for Chinese almond tofu, a great dessert that is gluten-free and vegan friendly. One of my readers ask me about how to make almond tofu that is ever present in Chinese buffet in United States. Well, the easiest way would be to buy almond tofu mix, but that feels a bit like cheating, but it works if you want to go the simplest route. 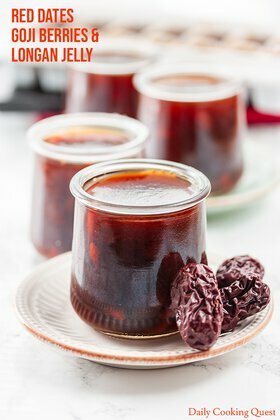 If this happen to be your favorite dessert and you want to have this often, it is a good idea to invest in buying a packet (it comes in box/jar/plastic bag) of Chinese almond milk powder, and either agar-agar powder or gelatin powder, this way, you can make it often and cheaply too. 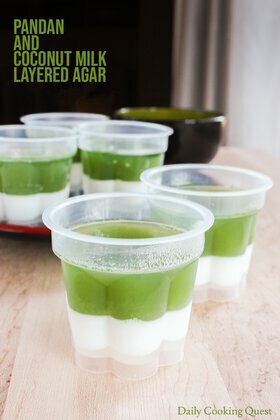 For vegan/vegetarian, stick with agar-agar powder. Chinese almond powder is not made from almond nuts, but from apricot kernels, which is confusingly often translated to almond. So be extra careful when you buy your almond milk powder. If you use almond nut powder (or fresh almond milk), you will still get your dessert, but it will be the wrong one. 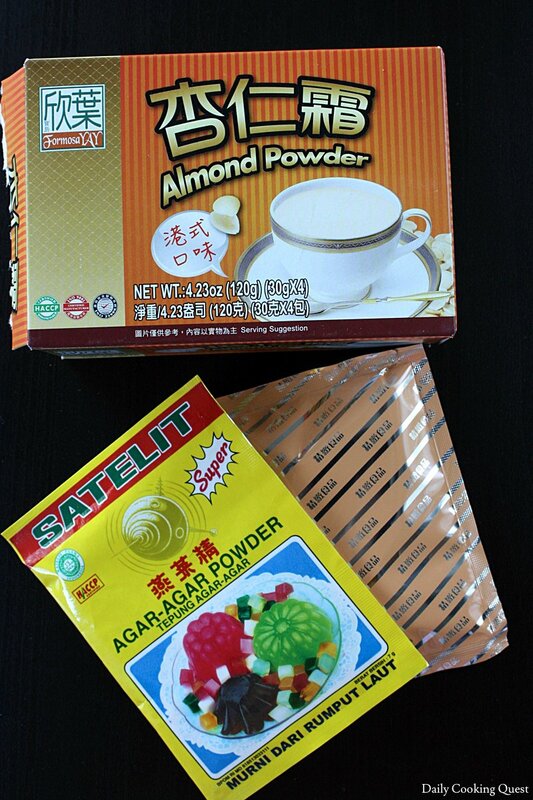 I haven’t been able to locate an online source to get Chinese almond powder, and I always buy this from brick and mortar Asian grocery. In my experience, they are usually located in the milk/tea/coffee aisle. 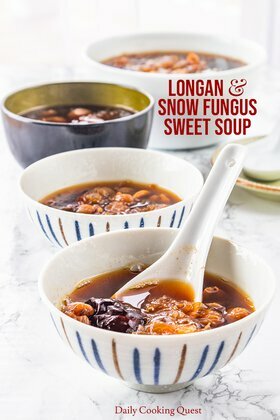 I have a photo of Chinese almond milk that I use for this recipe for reference. The recipe is really straightforward, but you do need to read the instructions that come with your particular almond milk and agar-agar/gelatin powder. My agar-agar powder asks for one packet mix with 800 ml water, while the almond milk requires one packet mix with one cup of hot water. So, I go with 3 packets of Chinese almond milk powder, 1 packet of agar-agar powder, and 750 ml water. I boil the three ingredients together in a sauce pot, whisking frequently to mix everything up. I cook for another 2 minutes once it reaches a boiling point, then I simply pour into rice bowls. You can also just pour into a baking tray if you want and cut into cubes once set. Next is simple. Let the milk and agar mixture chill in the fridge until set, about 1-2 hours. You can serve it from bowl, or you can cut it into cubes like the one in restaurant. Typically, almond tofu is served with a can of fruit cocktail. But I actually prefer to just cut up some fresh fruits, like berries or stone fruits (peaches/nectarines), and some maple syrup. Simple is best. 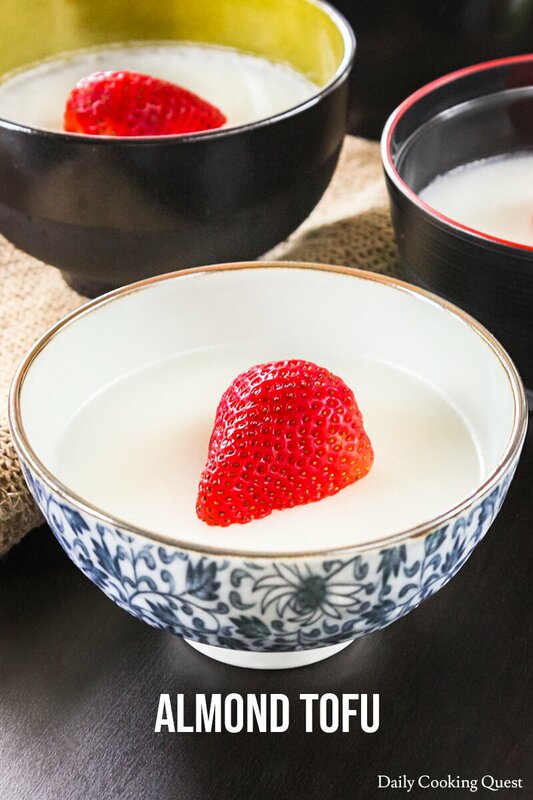 Whisk together agar-agar powder, Chinese almond milk powder, and water in a sauce pot. Turn heat on and bring to a boil, whisking frequently. Once it boils, cook for another 2 minutes. Turn heat off, and pour into bowls/mold(s)/baking dish. 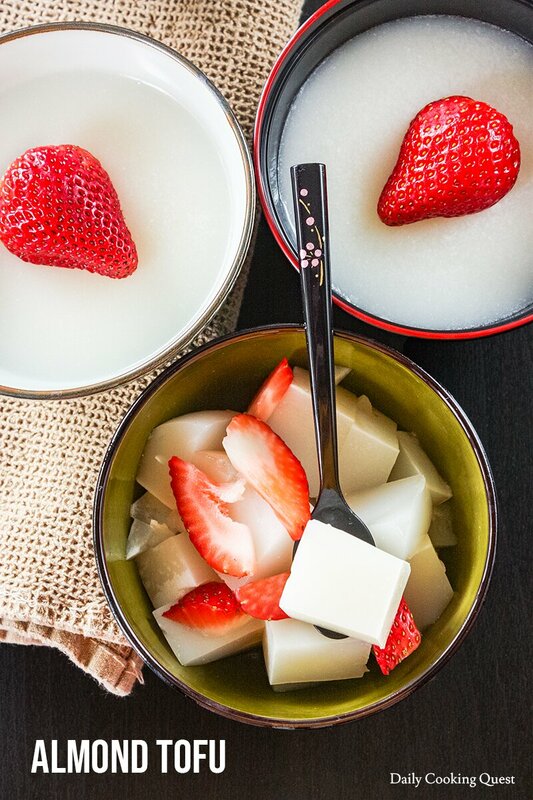 Serve almond tofu with a can of fruit cocktail. 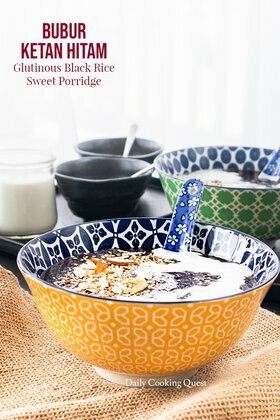 Alternatively, serve with fresh fruits and maple syrup.